Ator 2 - L'invincibile Orion (English title: 'The Blade Master') is a film directed by Joe D'Amato. It stars Miles O'Keeffe as Ator, Charles Borromel as Akronos, Lisa Foster as Mila, the daughter of Akronos, and David Brandon as Zor. Akronos has discovered the Geometric Nucleus during the course of his research. The Nucleus is a device of incredible power that could be a terrible weapon. Akronos feels that the Nucleus must be kept from evil men at all costs. When he learns that the evil Zor and his army are approaching his castle, he asks his daughter Mila to bring his former student Ator back to help defeat Zor. Mila runs away to find Ator. Zor's soldiers enter and begin beating Akronos, but Zor angrily sends them away to maintain the image of a man who would only use violence if needed. Mila is pursued by Zor's soldiers, and is wounded by them, but continues to stagger towards Ator's home. At last she arrives, and Ator uses his medical knowledge to heal her wound. She then is able to convince him she is the daughter of Akronos, and that her father is in terrible danger. Mila, Ator, and Ator's Asian assistant Thong begin the journey back to Akronos' castle, facing a variety of dangers along the way, including a group of cannibals, another group determined to sacrifice them to their god — which is a huge snake — and other soldiers. Finally they make it back to the castle. While Mila and Thong sneak in the back way, Ator uses his knowledge of flight to quickly make a hang glider, which he flies over the castle, dropping bombs on Zor's soldiers. Having defeated most of Zor's forces, Ator takes on Zor himself and defeats him. Akronos convinces Ator to let Zor live to face trial, but when Ator steps away, Zor grabs a sword to threaten Ator, and Zor is killed by Thong. Afterwards, Akronos gives the Geometric Nucleus to Ator. Ator tells Mila he has to leave, that his life is too dangerous to share with her. Mila says that she knows Ator must fight evil where ever it occurs. Ator leaves Thong behind to help take care of Mila and Akronos, and leaves. He takes the Nucleus to a distant land, where he destroys it in a massive nuclear detonation. In early 1983, a few months after Ator, the Fighting Eagle, which was a commercial success, Joe D'Amato embarked on a new project, casting Miles O'Keefe again as the lead and Lisa Foster as his partner. D'Amato and scriptwriter José Maria Sanchez, who had already worked on the first Ator film, prepared a prehistoric film in the vein of the successful French film Quest for Fire (1981). The working title was Adamo ed Eva. According to D'Amato, when everything was ready for the shoot and rehearsals had already begun, Miles O'Keefe backed out for religious and moral reasons. Since he could in no way be convinced to play the role, Adamo ed Eva was transformed into Ator 2 instead. The film was made quickly and without a completed script and includes footage from the first Ator film in the form of flashbacks. According to Kinnard & Crnkovich, the film was released in Italy on December 16, 1982, while Michele Giordano states that filming only began in early 1983 and both Michele Giordano and Roberto Poppi maintain that the film was never theatrically released in Italy. On VHS, it was released by Eureka Video as Ator l'invincibile, which is the cinematic title of the first part. 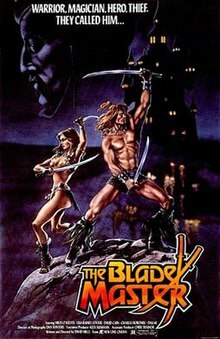 Ator 2 was released in the United States as The Blade Master on February 15, 1984 with a 92 minute running time. The film was shown on American television under the title The Cave Dwellers, a version of the film that included footage from the film Taur the Mighty. The film has also been released under the titles Ator the Invincible (Great Britain), Ator II - Der Unbesiegbare (Germany), and both Ator, el invencible and Ator 2, el invencible (Spain). Total Film included Ator 2 - L'invincibile Orion in their list of the 66 worst films of all time. In its Cave Dwellers TV version (sold by Film Ventures International), the film was parodied on the third season of Mystery Science Theater 3000. ^ a b c d e f g h i j k Kinnard & Crnkovich 2017, p. 200. ^ Kinnard & Crnkovich 2017, p. 201. ^ a b Poppi 2000, p. 54. ^ a b c d e f Giordano 1998, p. 142. ^ a b Smith 1995, p. 27. ^ "66 Worst Movies Of All Time". Total Film. 2012-02-15. Retrieved 2013-09-30. ^ Rees, Shelley S. (2013). Reading Mystery Science Theater 3000: Critical Approaches. Scarecrow Press. p. 59. ISBN 9780810891418. Retrieved 7 March 2019. Giordano, Michele (1998). Giganti buoni: da Ercole a Piedone (e oltre) il mito dell'uomo forte nel cinema italiano. Gremese Editore. Kinnard, Roy; Crnkovich, Tony (2017). Italian Sword and Sandal Films, 1908-1990. McFarland. ISBN 1476662916. Poppi, Roberto (2000). Dizionario del cinema italiano. I film dal 1980 al 1989. Vol.5, tomo 1, A-L. Gremese Editore.